Recently, I have been trying to find out more about an extraordinary woman called Isa Benzie, who forged an illustrious career at the BBC in the male-dominated world of foreign affairs. Joining the BBC in December 1927 as a secretary in the Foreign Department, she then worked her way up to become Foreign Director in 1933, a position she held until she left the BBC in January 1938. Her ten years in the Foreign Department are not easy to pin down. 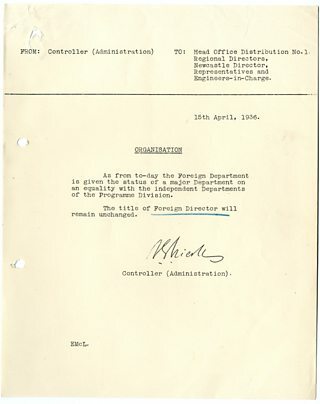 The BBC’s Written Archives Centre (WAC) hold a handful of administrative files, but these give very little information about what Benzie actually did. And the Foreign Department itself is illusive. Much of what I know about it has been garnered from the newspaper articles that lauded Benzie for attaining such an eminent post. Her BBC staff file does give some clues. She had been recruited to work with Major Atkinson, the original Foreign Director of the BBC. Atkinson was quick to recognise her capabilities and she was soon acting as his Deputy (she was promoted to the salaried Assistant grade in 1930). Atkinson was heavily involved in the work of the IBU – the International Broadcasting Union. From the early 1930s there had been a push for European broadcasters to share facilities and programmes and this became central to Benzie’s work. She took on responsibility for ‘relays’ which was the broadcasting of overseas programmes on the BBC – and of BBC programmes on overseas networks. Isa Benzie was not the only woman who worked in the Foreign Department. In 1930, she had recommended her close friend Janet Quigley for an Assistant post (word of mouth was a key way of getting into the BBC). 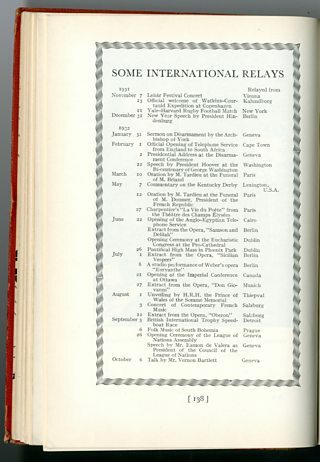 Quigley, like Benzie, was an Oxford graduate and she too was given important work – particularly overseeing the burgeoning American relays. By chance, I have recently come across a new photograph of Benzie and Quigley at this time. I am co-curator of the ‘100 Voices that Made the BBC: Pioneering Women’ website and part of my role has been tracking down images of BBC women. It was a great thrill to find a group shot of the new Foreign and Empire Department taken in 1932. Here, Quigley and Benzie sit demurely to one side. Beside them are Atkinson, Carpendale and Graves, who were then the department heads. 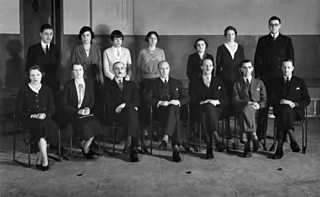 BBC Foreign & Empire Department, 1932: Janet Quigley is to the far left with Isa Benzie on her left. The image is from an interesting point in time because shortly after this was taken, Atkinson ceased to be Foreign Director. Isa Benzie was the obvious choice to take on the role. With Quigley as her assistant, the Foreign Department was now effectively run by two women. The personal and administrative documents held by WAC give few clues about the work of the Foreign Department, so I needed a new tack. This was when I enquired about ‘Relay’ files. The index the archivist emailed to me was sent “with trepidation” - understandable, as it was 67 pages long. Ultimately, around 25 files from the interwar years were selected – and they divulged an unexpectedly rich story. 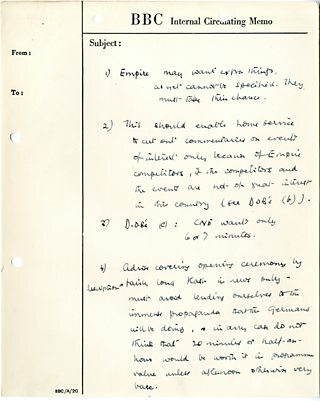 As the number of files indicates, the organisation of relay work remained a key focus of the Foreign Department. The majority of the extant documents are about the American work, revealing the confidence and aplomb of Janet Quigley. She was in frequent correspondence with the two representatives of the NBC and CBS who were based in London – Fred Bates and Cesar Saerchinger. The rivalry between the two men is at times comical, something that she and Benzie evidently enjoyed. Benzie’s role as Foreign Director was a significant one. She worked alongside the BBC’s most senior executives and in 1936, her position as a major BBC head was confirmed. Janet Quigley left the Foreign Department in 1936. She was transferred to the Talks Department to work on Morning Talks for women. Her replacement Cecilia Reeves (who would ultimately become the BBC’s Paris Representative) has no personal file, so her role as Benzie’s assistant is hard to discern. Benzie did recruit a second Assistant, in 1935. This was Richard Marriott, then 24 years old. His personal file shows how Benzie kick-started what would be an impressive BBC career. Having spotted his potential, she nurtured him and put him forward to be her replacement when she left the BBC on her marriage in 1938. There is much more to learn about Benzie and Quigley, who both had important post-war careers. 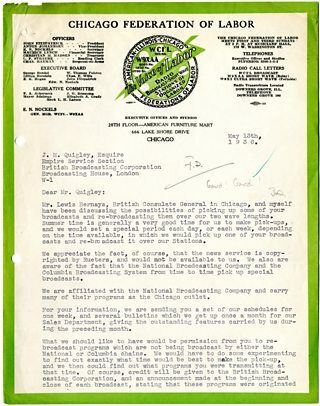 But thanks to WAC, we at least know a little more about their early years at the BBC. Every year the BBC opens its archives to a wide range of academics researching the BBC’s role in national and international history. Their research leads to bestselling books, academic papers and in-depth journalistic articles. This blog reveals the variety of BBC themes explored by academia.